Welcome to the Rich Money Habits Resources section, a list of my own personal recommendation. Many of the things listed here are crucial in my personal journey to get to where I am today. I have tested every recommendation on this page. For those who are still starting out in their financial journey. Perhaps you are heavily in debt, or starting to figure out the maze of information regarding personal finance, one thing I recommend is to grab a copy of the book, Rich Dad Poor Dad By Robert Kiyosaki. That’s the book that got me started to exploring this journey called the pursuit of Financial Freedom. During my early years back in 2007, one thing that helped me was becoming a member of the Truly Rich Club. This is an online membership site that helps you get started laying out the foundation for your financial blueprint. I was abroad then and since there were a limited seminars I knew of that time, this is an alternative I was willing to try out. Bo Sanchez is a preacher in the Philippines, who now enjoys time freedom and financial freedom. Most of his businesses support the ministries. You can learn more about my Review Here. But if you’re ready to explore becoming part of the club, you can CLICK HERE to join the Truly Rich Club. After becoming a member of the Truly Rich Club, I also attended lots of seminars ranging from P500 – P10,000+ fees on a half-day or 2-day session. I explored the worlds of Stocks Investing, Internet Marketing, Real-Estate Investing, Network Marketing and a whole lot more. There’s a certain excitement you feel when you are fairly new to the world of business. Most of what I thought I knew was based on books. Deep down I felt, I had to gain a lot more experience to really make sense and succeed. 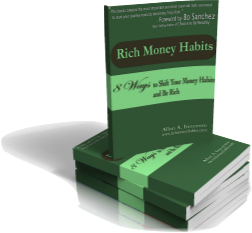 The early days when I was still exploring the world of money, I wrote a book titled Rich Money Habits – 8 Ways to Shift Your Money Habits and Be Rich. It was a small project I did as part of exploring the world of internet marketing. There were so many firsts I experienced in that project. Much to my delight, people actually wanted to pay for what I shared with them. These are the experiences and the ideas that laid our the foundation for me to be able to resign from my 9-year IT career. Today, it’s 2018, more than 7 years since I last held a job. I am thankful for that opportunity to escape the life that no longer resonated with my path with a soul. If you are at that stage where you are exploring the world of business and would like to learn the basics of personal finance. You can download and read my book. It’s FREE. Bo Sanchez was kind enough to read and write the foreword to my ebook and he said, “This (e)book contains the most essential tools you need to start your journey towards becoming truly rich. CLICK HERE to download the FREE e-book! Aweber – This is my default email autoresponder solution. I’ve been using this for a long time and has provided me with the basics of setting up your own newsletter. My favorite part is in being able to setup a sequence of emails upon subscribing. Anything that automates the process is something I’m all into. Being an IT guy, I hate seeing manual work when there’s a solution that is both elegant and effective. There are other providers like Mailchimp and Convertkit. Both have pros and cons. But aweber is enough for me for now. There’s not much difference in pricing. If you just want a simple email auto-responder, this is a good place to start. If you plan to migrate to another provider later on that can also be arranged. I tried migrating to Convertkit a few months back but the hassle of learning a new control panel and setting up your email series again stopped me. Maybe in the future. For now, I think aweber is still able to do most of the things I want to do. CLICK HERE to get aweber for your email automation needs. Dreamhost – This is my default hosting provider. A hosting solution keeps your files backed up safely. These days there’s a 1-click button you can use to install WordPress right from your hosting account. This allows you to have your blog setup within 5 minutes. So you can focus on writing and customizing the design and not have to worry about all the technical stuffs. One thing I liked about dreamhost is the ability to host multiple sites in just one account. If your site is just starting and the traffic to your website is not that high yet, then dreamhost is for you. However, if you gain traffic in the range of thousand(s) or millions of unique visitors a day, there might be a need to upgrade into another plan or at another solution for that specific need. CLICK HERE to avail your $50 discount promo if you get the unlimited share hosting plan. UPDATE (as of Dec 5, 2018), I’ve upgraded my hosting from a shared hosting which is around $5/month to use VPS ($15/month). Godaddy.com – This is where I bought and registerd my domain name akosiallan.com. URL is like your home address. It is where people can find you. These days you can get for a little less than $9 per year. I used to have a blog with the akosiallan.wordpress.com and akosiallan.blogger.com but I found that it’s better to have your own domain so you have more control on how you want to do it. There are other providers out there but the difference is negligible. If you just want a simple solution, Go daddy has been around for some time and so far they have not failed me yet. So I am happy to recommend it to you. WordPress.Org – This blog is powered by WordPress content management platform. WordPress is popular nowadays. I feel most of the websites are powered by WordPress. This is because of its ease of use and the flexibility to add-on a lot of things. Developers are constantly coming up with a lot of exciting plugins you can use, both FREE and PAID. This allows you to make your blog article be share-able, more robust and powerful with all the bells and whistles. Growing up, I wasn’t much of a reader. I preferred reading comic books. Or just playing outside the house. Even when I was in college, most of my books were textbooks. Fast forward when I got curious about the world of business, money, investing. Most of my time was spent on browsing through the titles in the bookstore. 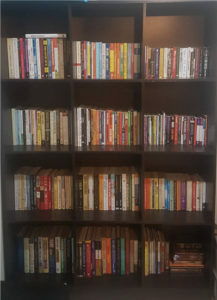 Just recently, I think I might have collected more than a hundred books already since then. Funny thing is that all of them I bought when I was already working and continued even when I was already full-time in business. Here’s a summary of the Top 10 Books of All Time I wrote awhile back. Top 10 Personal Finance Books of All Time. If you are curious to know what are the other books I read, you can click here. For those who want to venture into Foreclosed Real-estate, go on and head over to ForeclosurePhilippines.com. Jay Castillo is a personal friend of mine. I can vouch for his integrity in doing the business. He used to work as an IT manager as well but due to stress he decided to pursue real-estate investing and blog his adventures in his site which is right now one of the most popular websites in the Philippines. I have friends also who are into real-estate investing like Maves Angeles who is into build and sell, and Eden Dayrit who was a business partner for a rent-to-own deal a few years back. They specialize in different areas. I bump into them once in a while when I help facilitate Cashflow Board game at Think Rich Pinoy workshops, as well as in Kerygma Conference. Sha Nacino, is an author who also teaches other authors how to write their own book within 90 days. She is also a personal friend of mine. I am currently doing the 90-day book writing challenge to help me finish my 2nd book. My plan is to share the experiences I’ve had the past 7 years while doing business. Looking back, I am fortunate to have had the chance to share the message to seminars and talks I am invited to. People are curious to learn about how they can overcome debt, how they can save without feeling guilty, how to grow their finances. Much of personal finance is basic, but when you mix in emotions like greed and fear, it gets really complicated. Experience has allowed me to appreciate the psychology behind every financial decision we make as emotional beings. Watch out for that. You can SUBSCRIBE to my email newsletter so you will get notified when it’s finally ready. Simply enter your email below.